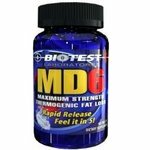 MD6 for me is undoubtedly the best medication to help reduce extra weight. Its scientific formula is very efficient in burning extra fats and does not have any side affect. The MD6 is convenient in use can be used by everyone who wants to burns extra fats. The MD6 is very easily available. price is reasonable. I had no success with anything until I tried this. It absolutely blew me away with how well it works. You don't even have to take that many. No cons at all really, other than the taste of them.